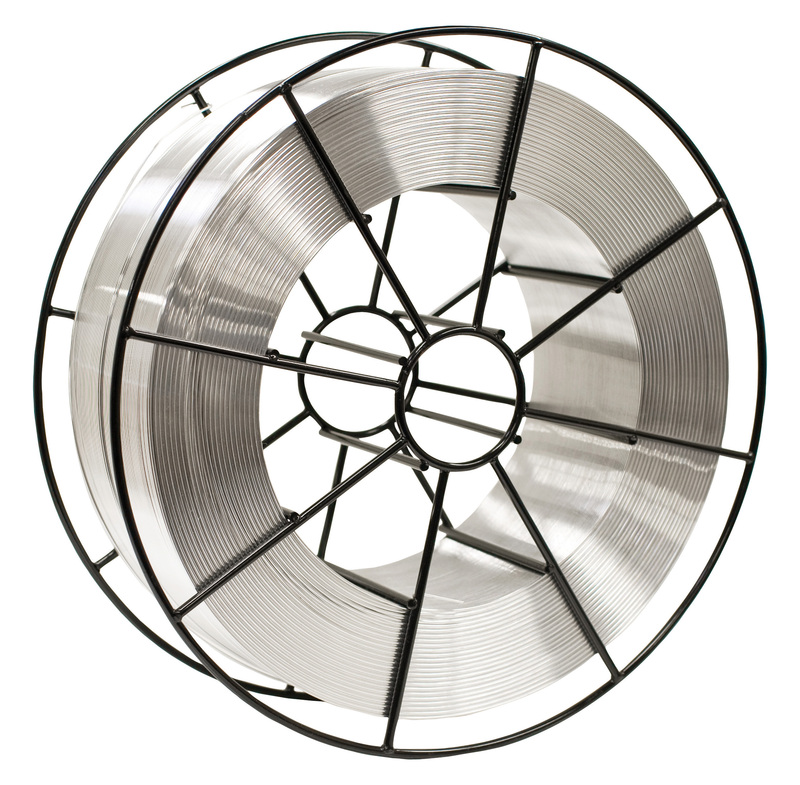 1XXX alloys — These alloys are usually used for their electrical conductivity and/or corrosion resistance. Their sensitivity to hot cracking is very low. They are usually welded using 1070, 1100 or 1188 fillers, but matching filler metals are also available for specialized alloys such as 1350. If electrical conductivity of the joint is not of primary importance, 4043 may be used. 2XXX alloys — Many alloys in this series are not arc weldable. Those that are arc-weldable include 2219, 2014, 2519, 2008, and 2036. Alloy 2319 is a matching filler alloy for 2219 and 2519 and can also be used on the other weldable alloys. Alloys 4043 and 4145, which contain copper, can also be used. Alloy 5XXX fillers should not be used to weld 2XXX parent materials, because cracking will result. 3XXX alloys — These moderate strength aluminum–manganese alloys are relatively crack resistant and can be welded easily using either 4043 or 5356. 4XXX alloys — These alloys are usually found as welding or brazing fillers. In the rare event they are encountered as parent materials, 4047 is usually the best choice as a filler metal. 5052 — This alloy has enough Mg content to exhibit a relatively high crack sensitivity. If it is welded with 5052 filler alloy, it will often crack. To avoid the tendency to crack, 5052 is usually welded with a filler alloy of much higher Mg content, such as 5356. The resulting weld metal, which is an alloy of the 5356 and 5052, has a Mg content high enough to be crack resistant. Additionally, the Mg content of 5052 is low enough so that it is the only 5xxx alloy that can be successfully welded using 4043. High temperature applications — Al-Mg alloys with Mg content over 3% are unsuitable for service temperatures over 150°F (65°C) because they are susceptible to stress corrosion cracking at higher temperatures. This is true for filler alloys as well and should be taken into account in selecting filler alloys 5454 — This alloy is a lower Mg alloy specifically developed to be immune to the stress corrosion cracking noted above. Filler alloy 5554 is designed as a matching filler alloy for 5454 and should be used whenever possible. 5083 and 5456 — These high Mg, high strength alloys can be successfully welded using 5356. However, most structural Codes require that welds in these alloys have a minimum ultimate tensile strength of 40 ksi (276 MPa). When welded using 5356, welds in these alloys often will not meet this requirement. For this reason, 5183 or 5556 are recommended for these alloys. 6XXX alloys — These Al-Mg-Si alloys are primarily used for extrusion alloys, although they can also often be found as sheet and plate. The chemistry of these alloys makes them very sensitive to hot short cracking. Autogenous welds (i.e., welds made without adding filler metal) are prone to cracking. These alloys are readily weldable using either 4043 or 5356 filler metal. Since the chemistry of 4043, Al with 5% Si, or 5356, Al with 5% Mg, is so different than that of 6061, when either is mixed with 6061, the result is a weld with a crack resistant chemistry. The decision whether to use 4043 or 5356 depends on a number of factors summarized in Table 1. This table compares these two common filler metals and shows the advantages and disadvantages of each. As shown in Table 1, 4043 is easier for the welder to use, it flows better, and is more crack resistant. Filler metal 5356 feeds better and gives welds that are stronger, especially in lap welds and fillet welds, and are more ductile. While 5356 should be used to weld the 6XXX alloys to any of the 5XXX alloys, 4043 should be used to weld the 6XXX alloys to the common 3XX.X casting alloys. Note: 5356 should be used for applications that will be subsequently anodized. 5356 will anodize to a color very similar to the parent material. 4043 will turn dark grey on anodizing. Since the 6XXX parent materials anodize to a clear color, a 4043 weld is very visible and not desirable. 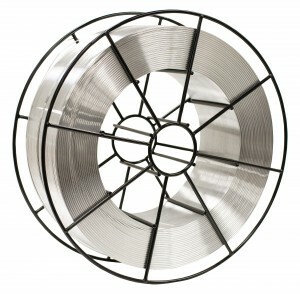 7XXX alloys — Although most of these alloys are not arc-weldable, 7005, 7003, and 7039, display good weldability. These alloys should be welded using 5356.